These five points illustrate the core strengths of GRENA. You can count on our range of products for a whole variety of crops in eco, integrated and conventional farming. In particular, we want to draw your attention to our processing system THPÂŽ: thermal hydrolysis without addition of chemical agents allows the organic matrix, foundation of all our fertilizers, to be as natural and soil-friendly as possible. 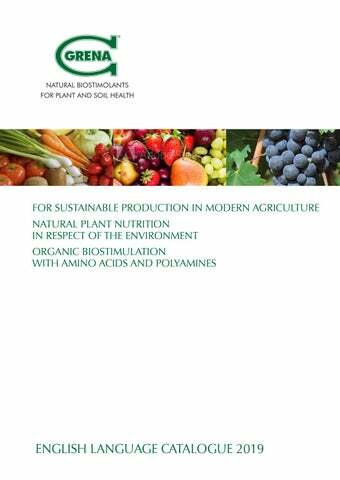 WHY TO USE OUR BIOSTIMULANTS GRENA STANDS FOR SUSTAINABLE AGRICULTURE Farming is going through one of its toughest moments as the market requests increasingly higher product quality in terms of taste and sustainability while continued synthetic fertilizer (over) use has deteriorated soil health and quality. In light of new, responsible environmental regulations the challenge in modern agriculture is still to produce “bigger and better”, but in a sustainable fashion. GRENA organic biostimulants with fertilizer function •	convey macro and microelements in a ecosystem-compatible way and activate the soil’s natural regeneration from the get-go without compromising on yield •	mediate a diverse supply of organic matter activating the microflora of the root zone to guarantee natural authenticity of aromas •	integrate perfectly into every existing agricultural practice. GRENA MINDS ENVIRONMENTALLY SOUND PRODUCTION The thermal energy demand of our production, essentially for the hydrolysis process and the pressing of pellets is met with energy from clean, renewable sources. As a matter of principle, excess thermal energy is shared via district heating lines to surrounding structures. We pay particular attention to rigorous control and continuous reduction of all emissions. GRENA UNDERSTANDS LASTING VALUES Over the past few years, GRENA has worked tirelessly to make the production of our fertilizers sustainable. The effort, both of economic resources and of human capital, has been and continues to be considerable, but it goes hand in hand with our wish for constant improvement. Today, we can guarantee a production as environmentally friendly as possible. Something that has never changed is our focus on the use of renewable resources: the organic matter of animal-origin, from where all GRENA products are born. This solid foundation has meant that updates in our production process have not compromised the biostimulating quality that sets GRENA products apart from the rest. GRENA MISSION Constant research and development keeps our expertise up-to-date and helps us to further improve our understanding of the mechanisms by which GRENA products positively influence plants. Close relationships with various test centers and universities allow for highest quality field and laboratory studies. Respect for the environment through technologically advanced systems, rigorous control of emissions, waste prevention systems and constant checks and analyzes. Innovation in organic fertilization: products that ensure yields and improve quality while respecting nature through the use of lower doses. Plant stress intervention and alleviation via polyamine biostimulation. Connecting research and agriculture: We apply ourselves to continuous dissemination action making the methods and usage of biostimulants known to a larger audience. 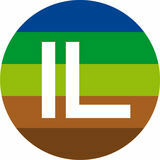 Through conferences and events, we instruct technicians and farmers for a more rational use of resources in agriculture. THE GRENA METHOD THP® (Thermal Hydrolysis Process) ETHP® (Evaporation Thermal Hydrolysis Process) The GRENA production process (THP®) unlocks biological potential of organic residues for the safe and effective return to agricultural soils. Modern understanding of circular flows in the sense of natural matter cycles is deeply embedded in the work that GRENA carries out. Thermal hydrolysis of animal protein without the addition of any chemical reagents or enzymes leads to ecoproducts also suitable for organic farming. Our processes are in accordance to the European directive 1069/2009, prevent waste and safely recycle food residues for the benefit of the environment. The heat treatment of the organic matter of animal origin is carried out in autoclaves that use indirect steam as a thermal vector. It is precisely through these cooking and cooling cycles (for the duration of five hours) and subsequent sterilization (133° C at 3 bar pressure) that hydrolysis takes place. Hydrolysis releases amino acids and peptides from large proteins while the applied thermal energy assists the formation and extraction of polyamines. The line of liquid biostimulants is created from the evaporation of moisture during the processing and sterilization of our organic raw materials (ETHP®). Several steps of filtration following the condensation of the said vapors lead to our uniquely effective polyamine extract IDROGRENA. Quality control check-up: at GRENA, incoming raw materials as well as our own finished products are subject to continuous monitoring through weekly analyses that are carried out in certified and accredited external laboratories. ECO-CERTIFICATIONS & AUTHORIZATIONS GRENA s.r.l. applies the production methods for use in organic farming laid down in European Commission (EC) Regulation No. 834/2007 and No. 889/2008 with any subsequent amendments and additions. Our products undergo annual certification and are thus listed in the major inputs lists for organic farming: FiBL, InfoXgen, BCS Öko-Garantie, ECOCERT, IMO Control and SHC. The information provided in this catalogue serves as guidelines only. For the correct use of our products, please consult a specialist and always read the care instructions on the labels. While GRENA s.r.l. guarantees the quality of its products if correctly stored and with the packaging intact, the company is not liable for any damages or partial results deriving from incorrect use, or any use that is not in compliance with the guidelines of Good Agricultural Practice (GAP) and/or any use which is inconsistent with the recommended instruction. INTRODUCTION: BIOSTIMULATION WITH AMINO ACIDS Proteins and enzymes are crucial to the cell’s functioning, amino acids are the building blocks from which they are assembled. In the soil, amino acids thus. 1.	increase root proliferation, promote various symbiotic processes associated with this plant organ (e.g. root nodules, mycorrhizae) and facilitate the synthesis of phytohormones. Amino acids benefit the growth of the root system thus increasing the plant’s anchoring and absorption capacities. 2.	increase chelating capacity in relation to the principal nutrient elements (N, P, K) but also mesoand microelements present in the soil or provided by solid GRENA biostimulants with fertilizing properties. In effect, these nutrients become more easily absorbed by the roots. 3.	contribute to the plant’s nourishment with a form of organic nitrogen that is energetically advantageous because of its direct utility for protein or enzyme synthesis. Mineral or other organic nitrogen forms in contrast first need to be turned into amino acid building blocks by the plant. 4.	stimulate the activity of micro-organisms in the soil, which in turn promotes the organic matter cycle (production and decomposition) increasing absorption and availability of nutrients in the root zone. The microflora of soil bacteria, fungi, algae and animals is profiting from amino acids as highly energy-efficient nutrient source and can quickly populate all ecological niches in the soil, thus making the treated fields more resilient against colonization and persistence of pathogenic species. Nitrogen reserve, complexing activity, precursor of new amino acids. Resistance to different environmental stresses, nitrogen reserve, increase of germinability, strengthening of photosynthetic activity and of chlorophyll content, complexing activity, regulation of stomatal opening, precursor of new amino acids, takes action in the resistance mechanisms of the plant in adverse situations, promotes the uptake of inorganic nitrogen. Fragrance and flavour precursor, strengthening of photosynthetic activity and of chlorophyll content, regulation of stomatal opening. Root development, nitrogen reserve, flavour precursor, induces the synthesis of related hormones. This is the main amino acid with chelating action. It is fundamental for the formation of chlorophyll. It takes action in the resistance of the plant in adverse situations. Flavour precursor, strengthening of photosynthetic activity and of chlorophyll content, complexing activity. Resistance to different environmental stresses, strengthening of photosynthetic activity and of chlorophyll content, regulation of stomatal opening. Root development, precursor of plant hormones, antioxidant capacity, regulation of stomatal opening. Precursor of ethylene, stimulates the development of sprouts and increases the quality and quantity of production. Precursor of growth factors such as spermine and spermidine. Resistance to different environmental stresses. Nitrogen reserve, flavour precursor, increase of pollen germinability, strengthening of photosynthetic activity and of chlorophyll content, takes action on osmoregulation, management of stomatal opening. Resistance to different environmental stresses. Precursor of plant hormones (auxins). Resistance to different environmental stresses. Fragrance precursor, antioxidant capacity. Amino acids are often precursor molecules in the synthesis of aromatic compounds responsible for fragrance (e.g. alanine, isoleucine, leucine and valine), colour (e.g. phenylalanine is the precursor of the biosynthesis of anthocyanins) and flavour (e.g. arginine, alanine, glycine and proline). The production philosophy of the organic carrier matrix, foundation to all our strictly organic or organo-mineral solid biostimulants with fertilizer properties, is based on the circular-flows principle in nature: Regeneration of organic resources and recovery of biological potential destined to return to the soil. The strictly controlled, organic GRENA matrix is naturally rich in levorotatory amino acids (a total of 26,5%, see table), peptides (aggregated amino acids), nutrient and essential trace elements as well as large natural diversity of humic, fulvic and carbonic acids. It is the refined matrix and its components that mediate the immediate effect on root proliferation, thus increasing absorbent radical surfaces and providing a selfpotentizing advantage for the plant. Amino acids and peptides occur in soils naturally but are under normal circumstances immediately absorbed by resident biota (microflora and plants). The uptake of intact amino acids conveys a significant advantage as the investment of resources and energy for their ex novo synthesis is conserved. Application of additional amino acids and peptides in GRENA eco-products thus directly boosts plant root and soil activity, in turn augmenting the organic matter cycle of production and decomposition and releasing the natural soil potential for plant nutrition. Amino acids also have antioxidant effects, mitigating the cellular consequences of abiotic stresses such as heat, elevated soil salinity or water deficiency or their combination (drought). Improved supply of amino acids thus improves soil and crop resilience. In concert with humic substances naturally present in the GRENA matrix (humic, fulvic and carbonic acids) the input of peptides and amino acids provides additional natural chelating capacity, facilitating the liberation and plant availability of nutrient and trace elements otherwise firmly bound and fixed in the soil. CHELATING ACTION OF AMINO ACIDS AND NATURAL WEALTH OF THE GRENA MATRIX Chelation is a natural chemical process taking place in the soil (see diagram). The formation of water-soluble complexes facilitates the plant availability and uptake of otherwise poorly soluble, firmly bound or fixed nutrients from the soil. Thus, the capacity for chelation by natural means is an important attribute of a healthy and productive soil. The characteristic organic biostimulant composition in GRENA products ensures the input and replenishment of natural chelating agents. Amino acids and peptides, humic, fulvic and carbonic acids all have chelating agent properties. Complex formation during production in fact plays an important role in the high efficiency of GRENA organic and organo-mineral formulations: organic acids and peptides (themselves being nutrition sources) arrive as nutrient chelates (actual organomineral complexes of e.g. iron, phosphate, magnesium) and subsequently continue their work in the soil. The GRENA matrix, foundation to all our products, naturally contains meso and micro elements. These nutrients are no additives but stem from the responsibly sourced and rigorously controlled organic matter of animal origin (fish, rabbit and poultry) entering the GRENA thermal hydrolysis process THPÂŽ. Calcium (Ca)	9,90	% Besides the content of organic nitrogen (i.e. N bound in amino acids), the basic matrix foundation also naturally Magnesium (Mg)	0,20	% contains phosphates (PO42-) and potassium (as oxides Iron (Fe)	660	mg/kg K2O). A rich source of calcium (Ca) in our fertilizers are Boron (B)	4,62	mg/kg egg shells, magnesium (Mg) instead originates mainly Cobalt (Co)	0,17	mg/kg from fish. Respectively aiding plant and fruit tissue stabiManganese (Mn)	37,2	mg/kg lity (cellular walls) and photosynthesis (energy conversion Molybdenum (Mo)	0,92	mg/kg and carbon fixation) are the meso elements calcium (Ca) Copper (Cu)	5,75	mg/kg and magnesium (Mg). Among the manifold functions of Zinc (Zn)	67,2	mg/kg the micro elements in plants, the use of boron (B) for sugar translocation into the fruit, the utility of copper (Cu) in the lignification (wood generation) of plant tissue as well as the stimulation of Auxins (plant hormone) by zinc (Zn) shall be mentioned. Thanks to the high quantities of amino acids, peptides, humic acids, fulvic acids and carbonic acids, the various formulations of GRENA products can easily carry (via chelation) nutrients from the matrix to the plant as well as continue this function in the soil. GRENA products are strictly adhering to the principles of a circular economy, moreover recognizing the need to safely recover and prepare biomaterials for their use in agriculture. OPTIMAL BALANCE IMMEDIATE AVAILABILITY MEETS LONG-TERM EFFICACY All GRENA products contain amino acids, due to their universal occurrence in living beings and constant utilization they represent the best organic form of nitrogen (N) for application in agriculture. Amino acids not only provide an immediate release and availability of nitrogen but may also be absorbed intact (energetic advantage). Peptides and larger denatured proteins (long amino acid chains) instead see decomposition before the Nitrogen bound therein may become plant available. This is a natural, soil ecosystem health supporting, long-term slow release (2-4 months) function that is free of foreign substances or synthetic polymers. ADDED VALUE OF SLOW RELEASE A proportion of the organic nitrogen (peptide and protein bound N) present in GRENA solid organic biostimulants 100 with fertilizer properties can only be used by plants after 80 a series of mineralization processes. These processes are 60 carried out through different stages of organic matter 40 degradation and rely the metabolic activity of numerous 20 biodegrading micro-organisms that populate the soil. 0 This property avoids nitrogen loss due to wash-out or 0 30 60 90 120 evaporation commonplace in mineral fertilization practices and further mediates a continuous release of N into the soil solution. In addition, the application of organicLong term availability of Nitrogen in the soil using GRENA organic fertilizers compared with ally bound nitrogen preserves rhizome and mycorrhiza a common mineral fertilizer symbionts from taking damage and thus is crucial in the tending of soils under permanent cultures like wine, fruit trees or berry bushes. The degradation of peptides or proteins (eventually leading to the liberation and plant availability of nitrogen and amino acids), takes place by means of extracellular proteases, capable of hydrolyzing peptide bonds (connecting amino acids into chains) and provides substrate, food as well as biostimulation to plant and soil microflora. NITROGEN (N) MINERALIZATION Results for GRENA ULTRA MICRO product test from the University of Bologna, Department of Agricul100 tural Sciences (Prof. Ciavatta) 80 The test results show that nitrate is released gradually 60 (from mineralized amino acids, peptides and proteins) 40 over the first 4 weeks of incubation. After this period 20 the N concentration remained constant around 110 mg 0 per kg of soil. The mineralized N, calculated as the dif0 30 60 90 120 ference between the inorganic N of the treated soil and that of the un-fertilized soil (control), showed an effecLong term availability of Phosphorous in the tive mineralization of the added organic nitrigen. In the soil using GRENA organic fertilizers compared soil treated with GRENA ULTRA MICRO, it reached about with a common mineral fertilizer 150 mg per kg at the end of the incubation period (8 Key: other product Grena weeks), a value corresponding to 50% of the total added N (which was equal to 100 mg per kg). It is important to emphasize that the release is gradual and affects the whole of the incubation period. GRENA ULTRA MICRO showed effective mineralization of N, reaching good percentages (50%) in a gradual manner and over a short amount of time (28 days). The structurally diverse group of humic and fulvic acids are naturally generated in soils due to the decomposition of organic scaffold compounds like lignin (wood) as well as cellulose and are formed during the GRENA THP® process. Their large surface area and slow decomposition rates in the soil pose an important property of the permanent humus. Humic and fulvic acids are responsible for the formation of organo-mineral complexes with poorly soluble elements (i.e. Fe, Mn) present in the soil and our solid biostimulants, thus facilitating their plant availability. Humic and fulvic acids act as indicators of organic matter, moisture and trace element presence to plant roots and thus stimulate length and lateral radical growth as well as the formation of secondary stands. Biostimulation of the amino acids increases in efficiency thanks to the synergy with the humic and fulvic acids naturally contained within GRENA products. Complexation of macro, meso and micro elements on humic and fulvic acids applied to the soil, gives rise to compounds called “humates”. In the soil, they increase the quantity of the elements mediated into solution, enabling the roots of the plants to absorb them and thus alleviates nutritional stress. ALI MERCATI INTERNAZIONALI Exemplary structural formulas of a humic acid fragment (A) and a fulvic acid (B); Complexes are formed involving carboxylic groups (R-COOH), hydroxy groups (R-OH) and amino groups (R-NH2) which are highly frequent on the surface of the humic compounds. SHAPE AND SIZE ADAPTED FOR APPLICATION Products in pellet form (4 mm diameter) are destined for distribution on fields intended for further tillage. The mechanical incorporation of the pellets into the soil guarantees their timely disintegration and the release of their nutrient freight. Micro flakes (2 mm diameter) are obtained from crumbling pellets. Micro forms are ideally adapted for surface distribution on grassy or plant-covered vineyard and orchard soils or over fields that will not undergo further forms of tillage. For their low visual impact, micro flakes are ideally suited for application in gardens or on sports grounds such as golf courses and pitches. MULTI-PURPOSE LIQUID BIOSTIMULATION: IDROGRENA The active ingredients of the liquid biostimulant IDROGRENA are natural polyamines, they are utilized and occur ubiquitiously in the cells of all living beings. Polyamines such as putrescine, spermidine and spermine fulfill a crucial task, the stabilization of information molecules (such as DNA and RNA). A fitting analogy of polyamine action is that of “bookmarks in the hereditary information”, keeping the sections currently relevant for the smooth conduct of the cell open and accessible. •	Duplication of the plant genome preceeding each cell division, thus germination as well as tissue, fruit and plant growth in general. •	Changing between genetic programs during normal development, such as when different tissue types are being produced (root, shoot, tuber, leaf, flower or fruit development). •	Swift adaption and deployment of stress specific response/ defense patterns regardless of biotic or abiotic nature of the strain. •	Flower attractiveness to pollinators while at the same time showing repellent qualities to mammals such as deer and boar. The universal biostimulative action of polyamines arises from facilitating and streamlining of DNA replication and transcription processes. These mechanisms are the very basis of cell division and tissue growth as well as transmission of commands from the nucleus to the cell. Understanding that the response patterns for changing environmental conditions and stress (i.e. due to drought, frost or pest attack) are encoded on the DNA allows to fathom the broad scope of polyamine application in agriculture. •	Spray application with plant protection products to alleviate detrimental side-effects and reduce recovery times. EXAMPLES OF APPLICATION: IDROGRENA IN THE FIELD IN COMBINATION WITH PLANT PROTECTION Besides the importance of polyamines as essential compounds for plant development under normal conditions, their stress alleviating potential is most strikingly demonstrated in cultures under strain. Plant protection treatments, even when carried out in the ideal way, always take their toll on the plant as well. While active ingredients are designed to selectively target a pest, these compounds also enter and interact with plant tissue (as frequently demonstrated by residues in fruit and vegetables). Polyamines in IDROGRENA help the plant to react to foreign compounds by facilitating the activation of cellular response patterns such as metabolization, compartimentation or even excretion. While the reduction of plant protention compound resdiues in food crops is still subject to investigation it is clear that plant recovery periods are shortend and the resumption of normal physiological activity is accelerated by the application of IDROGRENA. MOMENTS OF STRESS •	At the start of the culturing period after sowing or transplantation, early application of biostimulant polyamines generates merit via advantages in growth that potentize over the course of the season. •	During and after events of extreme weather or adverse climatic conditions (frost, heat, drought) the use of polyamines in the Idrogrena product family can shorten the reaction time and improve recovery. •	In case of pest infestation, polyamines augment the natural defense-response of plants such as the production of phytoalexins against the attack of fungus pathogens. •	Periods of morphological change such as flowering, fruitification and fruit maturation, demand the adaption of genetic programs to be executed signifying high energy demand for the plant – optimally supported by polyamine application. IDROGRENA IN HYDROPONICS AND SUBSTRATE CULTURES artificial culture environments As an alternative to traditional cultivation methods in the field, hydroponic and artificial substrate culture techniques are already well established. Frequently cited advantages regard the improved control of growth parameters as •	agricultural production can be de-coupled of from problematic soils with roots developing in an isolated environment •	environmental conditions can be optimized •	nutrient delivery can be standardized and minutely adjusted for the demand of specific phenological phases Technological requirements and strain on the plants in hydroponic and substrate cultures are high but the approach promises to augment yields in various ways: by an increase of cultivation season length, the shortening of the single culture cycle duration, the possibility of very high plant densities and accelerated ripening. IDROGRENA is perfectly suited to support the swift sequence of developmental efforts demanded form the plant and alleviate associated stresses. For their mode-of-action, polyamines universally facilitate the implementation of growth processes and pose a significant advantage in the phases of transplantation, flowering, fruit approach and maturation. Regardless of technological efforts, hydroponic and substrate cultures may be exposed to to higher degrees of stress as the buffering property of the soil is missing. For example, rapid changes in temperature may diminish the efficiency of the cultivation method due to metabolic processes coming to a halt. The anti-stress capacity of polyamines in IDROGRENA can smooth-out such fluctu-ations in plant physiological activity. ANTI-STRESS & BIOSTIMULATION VIA FERTIGATION and SPRAY soil applications Polyamines are essential cellular tools present in all living beings. Control and modification of polyamine group molecule cellular concentrations are achieved by ex novo synthesis, decomposition or transport between plant tissues. Polyamines are needed for cell replica-tion, thus nutrient resources as well as energy are continuously spent to produce them. Their application stimulates growth as well as current metabolic activity like â&#x20AC;&#x153;bookmarks in the genetic manualâ&#x20AC;? of an organism regardless of it being a plant, soil bacteria or mycorrhiza fungus. Thus, Idrogrena is a universal biostimulant, supporting the plant as well as the soil. Soil micro-organisms arranging for the turn-over and mineralization of organic matter, profit from polyamine provision just as growing root systems. Idrogrena delivery by micro-perforated irrigation hoses, surface sprinklers or occasional soil sprays/showers benefits all components of the root-soil system and increases the productivity as well as stress resistance of the plant (radical asphyxia, hypersalinity, drought). foliar applications Overhead sprinklers and occasional foliar sprays are optimal ways to selectively stimulate the green parts of the plant and help out in moments of stress. Polyamines are resorbed by the plant tissues and immediately benefit growth, maintenance work carried out to sustain photosynthetic activity and efficiency, alleviate stress or help with the staging of defenses. IDROGRENA is a fluid organic biostimulant with polyamines (2-PHE and Spermine). The effectiveness of the product is given by the rapid availability of organic compounds which can be immediately absorbed by the plant as well as by the useful microorganisms at root level. IDROGRENA is therefore considered ideal for use in foliar and irrigation applications (e.g. drip irrigation). The amines, once in contact with the roots, promote cellular reproduction and the issue of numerous secondary roots. The distillation process makes it free of salts and creates no phytotoxicity. IDROGRENA allows to perform many small applications to continuously encourage sustained and balanced nutrition throughout the productive time of the plant. If IDROGRENA is used preventively, it stimulates the immune system of plants, with an anti-parasitic effect. This curative effect of IDROGRENA is also expressed in a greater production of phytoalexins by the plant itself, making for a quick response against the attack of pathogens. Polyamines in IDROGRENA perform key roles, including but not limited to: •	resistance to stress in transplanting, drought and water stress, and in the event of adverse climatic conditions (frost, hail), radical asphyxia, and weeding; •	increase of the Brix (°Bx) Grade – indeed, polyamines have been acknowledged as modulators of various “channel” receptors, such as that of potassium; •	encouraging pollinator insects (bees, butterflies, moths, beetles) to approach the plants. When used as a carrier in weeding, IDROGRENA speeds up the process and allows for better control of the most resistant species, in particular Persian speedwell (Veronica persica), Plantago spp. Idrogrena, activates the micro-organisms in the soil. It is ideal in drip-irrigation or, where the system is not in place, in foliar application. IDROGRENA PLUS is a fluid biostimulant with increased content of polyamines (2PHE and Spermine) and added urea. The effectiveness of the product is given by the rapid availability of the natural compounds which can be immediately absorbed by the plant as well as by useful microorganisms in the soil. IDROGRENA PLUS is therefore considered ideal for use in foliar and irrigation applications (e.g. drip irrigation). The amines, once in contact with the roots, promote cellular reproduction and the issue of numerous secondary roots. The distillation process makes it free of salts and creates no phytotoxicity. IDROGRENA PLUS allows to perform many small applications to continuously encourage sustained and balanced nutrition throughout the productive time of the plant. If IDROGRENA PLUS is used preventively, it stimulates the immune system of plants, with an anti-parasitic effect. This curative effect of IDROGRENA PLUS is also expressed in a greater production of phytoalexins by the plant itself, making for a quick response against the attack of pathogens. Polyamines in IDROGRENA PLUS perform key roles, including but not limited to: -	resistance to stress in transplanting, drought and water stress, and in the event of adverse climatic conditions (frost, hail), radical asphyxia, and weeding; -	increase of the Brix (°Bx) Grade - indeed, polyamines have been acknowledged as modulators of various “channel” receptors, such as that of potassium; -	encouraging pollinator insects (bees, butterflies, moths, beetles) to approach the plants. When used as a carrier in weeding, IDROGRENA speeds up the process and allows for better control of the most resistant species, in particular Persian speedwell (Veronica persica), Plantago spp. Energy, a biostimulant with chelated meso- and micro-elements, and high miscibility. It regulates thermal changes and attracts pollinating insects. The right solution to obtain the right preservation, Brix (°Bx) Grade and uniformity of the final fruit. THE GRENA “APP” BIOSTIMULATION SYSTEM Foliar or radical polyamine action from IDROGRENA is ideally supported and complemented by amino acid and peptide delivery to the soil, nutritional-type biostimulants. All GRENA solids contain amino acids, peptides and protein as well as humic and fulvic acids that •	provide crucial variation of organic inputs to sustain the diversity of soil organism communities and enable recovery of impoverished soils. •	stimulate soil-plant systems directly by acting upon the plant roots and indirectly by activation of the microbial soil activity. •	facilitate the unlocking of soil-bound, sparingly soluble nutrients via complex formation and thus mediating their uptake by the roots. •	are easily and risklessly implemented with existing fertilization plans (i.e. due to partial substitution of nutrient inputs during organic or mineral base fertilization). Combination with the liquid IDROGRENA product family (systemic-type biostimulants) continues the delivery of growth stimuli over the culture season and is easily integrated with various works carried out in the field anyways. •	IDROGRENA is generated as a non-alcoholic distillate/ extract from cellular water without additives. The most versatile polyamine biostimulant is ideally suited as a carrier for nutrients in fertigation, micro-nutrients or plant protection agents for foliar sprays. •	IDROGRENA PLUS contains higher doses of polyamines and 6% nitrogen due to added urea. Ideally applied in frost and hoar protection via overhead sprinkling or fertigation. •	ENERGY IDROGRENA is for foliar application only and contains added meso and micro elements to support flowering, setting of fruits and their maturation. GRENA APP, the combination of Amino acids, Peptides and Polyamines is designed for implementation into existing agricultural practices. Solid and liquid formulations do not share the same mode-of-action and are thus complementing and not redundant. The application of GRENA solids benefits root zone and soil health, polyamines instead can be applied and absorbed by all plant tissue (leaves, roots, fruit) and thus allow for more directed and repeated delivery of biostimuli. Micro-pellet 2 mm obtained from crumbling of the pellet, for distribution over grassy vineyards and orchards, over fields that will not undergo further forms of tillage, and in golf courses and gardens. Micro-pellet distributions: easy, fast, practical. GRENA ULTRA MICRO was created for distribution on soils not subject to subsequent tillage (such as grassy vineyards and orchards). The micro-pellet formulation allows natural organic nitrogen to be readily available for plant nutrition. Thanks to the fast mineralization time, GRENA ULTRA MICRO is also ideal for last-minute fertilizations. The product meets the need for agriculture with a lower environmental impact: obtainable through a significant reduction in dosages, thanks to the natural presence of amino acids and humic and fulvic acids that facilitate the assimilation of nutrients. With GRENA ULTRA MICRO, the distribution is uniform and of low visual impact, excellent with transplanters. The presence of calcium enhances the organoleptic qualities of the vegetable tissues as well as increasing of preservability and crispness of the fruit. In vineyards, it promotes the development of regular internodes and a net increase in the final sugar content. Vines, orchards, fruits of the forest (blueberries, raspberries and blackberries), for treating iron deficiencies and in alkaline soils. ORGANOMINERALS Organo-mineral fertilizers represent an approach to mitigate one of the principal flaws associated with mineral fertilizers: the short retention time of plant nutrients of mineral form in the soil due to their readily water-soluble nature. The simultaneous input of organic matter intends the natural complexation and binding of nutrients onto the surface of organic matter particles to reduce the risk of swift wash-out without compromising on plant availability. For organo-mineral fertilizers a minimum content of 13% organic matter is required by regulation, all-too often this quantity is simply added into granular mineral fertilizers in the form of separate granules. GRENA BIOTECH 3.10.5 S (2 MgO) is obtained by reaction between the organic matrix and mineral materials: soft ground rock phosphate, potassium sulphate and dolomite – all are allowed in organic farming. The balanced allocation of organic nitrogen, phosphorus and potassium, makes GRENA BIOTECH 3.10.5 S (2 MgO) an excellent product Soil preparation of Vineyards and Orchards in the autumn-winter period. The presence of mineral magnesium activates the amino acids in the organic GRENA MATRIX, thus supporting the growth of plants and enhancing the taste of the fruit, while simultaneously building up the defenses of the plant. More Humic and fulvic acids are contents in GRENA BIOTECH 3.10.5 S (2 MgO), they are responsible for the formation of organo mineral complexes, with the chemical elements present in the soil, which would otherwise be not solubilized. GRENA BIOTECH 3.10.5 S (2 MgO) is available in micro-pellets (2 mm). The small size makes for a homogeneous distribution an important feature were GRENA BIOTECH 3.10.5 S (2 MgO) to be used on Vineyards and Orchards where it is not necessery to incorporated GRENA BIOTECH 3.10.5 S (2 MgO) into soil. Nitrogen is present in the form of amino acids and protein. The nitrogen action is accentuated by the noteworthy presence of phosphorus (10%), which is made to react with the humic and fulvic acids present in the organic substance, to encourage the formation in the soil of highly available and stable complexes. The presence of potassium sulphate – in soluble form and available for root absorption – promotes the formation of sugars. Magnesium, as part of the chlorophyll molecule, contributes substantially to vegetable and fruit crops, in order to prevent nutritional deficiencies and ensure the best physiological processes. SOURCE Organic: hydrolyzed proteins of animal origin by thermal hydrolysis Mineral: ammonium sulphate, DAP, potassium sulphate, dolomite. Recommended for: Long-term maintenance and soil preparation where the soil need phosphorus. Organic: hydrolyzed proteins of animal origin by thermal hydrolysis Mineral: ammonium sulphate, urea, DAP, potassium clhorure. Grena a family history The GRENA production site was launched in 1956 by the Founder, Comm. Teresio Magagna, assisted by his wife Amalia, and it produced protein hydrolysates for zootechnical use. In the 1980s, the turning point: the production and marketing of organic fertilizers, stemmed from an intuition concerning the potential of the GRENA organic matrix, an intuition soon honed by the relevant research and development. In the 1990s, some organo-minerals products increased the range of the organic fertilizers, and the liquid biostimolant IDROGRENA was launched. IDROGRENA revolutionised the biostimulant range by introducing polyamines for the first time. After a period in which the company produced fertilizers for third-party companies, GRENA entered the market under their own brand in 1995. Since 2011, GRENA s.r.l. has further specialized its production: the pellet format is now flanked by a new line of micro-pellet products. GRENA ULTRA MICRO got excellent market returns and feedback from the get-go. Even more versatile than pellet, it is suitable for orchards and grassed vineyards, where soil tillage is not possible, yet maintaining rapid mineralization and solubility. In 2013, ENERGY (with chelated micro-elements) joined the now well-established and appreciated IDROGRENA liquid biostimulant. The presence of GRENA products is no longer confined to the national market, instead it expands across borders in Europe and beyond. Today, among the many users of GRENA biostimulants we find: the French winemakers, the Spanish and Moroccan olive growers, German and Polish apple producers, as well as the horticultural productions of Hungary, Slovenia and Bosnia-Herzegovina, the fruit growers of Croatia and the producers of raspberries in Serbia, the strawberry-growers on the island of Malta, and the olive-growers in Greece and Lebanon, the producers of pistachios in Iran, and the banana-growers in the Dominican Republic and Ecuador. Within the great convivial feast that GRENA has become, Italian and foreign collaborators find space for growth, fulfillment and satisfaction, in a meeting of ideas and future development of the agricultural field. RESEARCH & DEVELOPMENT Research is one of the most important activities at GRENA, mainly because it is essential to the development of new formulations. Moreover, it is invaluable to discover the optimal usage of our products and verify the compatibility of our liquid biostimulants in integrated usage with plant protection products. The clear validity of GRENA products is confirmed daily by the feedback we receive from our customers: they are the first true architects of the success of GRENA biostimulants. Field trials carried out by our customers, with the support of our experts, are another vital part of our research. This is how we can ensure that our products are tested under the most diverse conditions. Healthier plants mean tastier food and by collaborating with the University of Bologna (Department of Agricultural Sciences) and with the University of Turin (UPTOFARM) we can organise tests both in the laboratory and in the field with studies on yields and tolerance to abiotic stress, such as drought and salinity. Through contact with companies Ort@, Terremerse, Fondazione per lâ&#x20AC;&#x2122;Agricoltura Fratelli Navarra, and Centro di Saggio Alsia, we verify how amino acids and peptides promote the accumulation of proteins, sugars and antioxidants; moreover, we conduct ecocompatible productivity checks. For communication that is both effective and immediate, we upload online videos of our speakers at various events as well as informative presentations on GRENA products, all available on YouTube. In the event of conditions with serious agricultural impact – such as sudden frosts or long droughts – we activate our newsletter, where we communicate to all customers on the list the best precautions to follow in order to contain water or cold damage. Dissemination of knowledge on a national scale is kept up to date regularly through events held by agronomists, with agents and farmers alike in attendance. These events contribute to sharing the results of the tests in progress and updating one another with information on the best use of GRENA biostimulants. Make way for the young! Conceptual and practical input from our younger workforce is always welcome at GRENA. BIBLIOGRAPHY & CREDITS Acuña, Catalina, “Poliaminas” (Universidad de la Costa Rica, 2011). Bartolini, Denis, “Verifica dei possibili effetti sinergici di IDROGRENA addizionato a TAIFUN MK CL (GLIFOSATE) per il controllo di infestanti graminacee e dicotiledoni” (Centro di Saggio Terremerse Soc. Coop., Bagnacavallo, Ravenna, 2015). Civolani, Stefano, “Efficacia della strategia di concimazione al terreno di Grena Ultra, Idrogrena fogliare e Idrogrena in manichetta su pomodoro da industria” (INNOVARICERCA srl, Monestirolo, Ferrara, 2014). Garufi, Alessandra, “Interazione tra le proteine 14-3-3 e l’h+-atpasi di membrana plasmatica: ruolo delle poliammine e via di trasduzione indotta dagli zuccheri” (Università degli Studi di Roma “Tor Vergata”, 2008). Hricovsky, I. Valšiková, M. Hronsky, Š., “Záhrada Pre Úžitok: Praktické Rady Záhradkárom” (Plat4M Books, 2013). Kusano, T. Berberich, T. Tateda, C. Takahashi, Y. “Polyamines: essential factors for growth and survival” in Planta (2008) 228, pp. 367-381. Jourdan, E. Ongena, M. Thonart, P., “Caractéristiques moléculaires de l’immunité des plantes induite par les rhizobactéries non pathogènes” in Biotechnol. Agron. Soc. Environ. (2008) 12-4, pp. 437-449. Montanaro, G. Dichio, B. Xiloyannis, C., “Esigenze nutrizionali e tecniche di concimazione per l’actinidia: supporto alla gestione sostenibile dell’actinidia per il miglioramento della qualità e la riduzione dell’impatto ambientale” (Università degli Studi della Basilicata, 2012). C. Ciavatta “Curva di mineralizzazione Grena Ultra micro” (Università di Bologna, dipartimento Scienze Agrarie), 2017. Hort@, Pierluigi Meriggi, Nicolò Lenzi “Effetto del biostimolante Idrogrena in pomodoro da industria” (Università Cattolica del Sacro Cuore), 2018. Hort@, Pierluigi Meriggi, Nicolò Lenzi “Valutazione dell’effetto fisiologico del biostimolante Idrogrena in pomodoro da industria allevato in serra” (Università Cattolica del Sacro Cuore, Ravenna), 2018. All titles are available upon request.